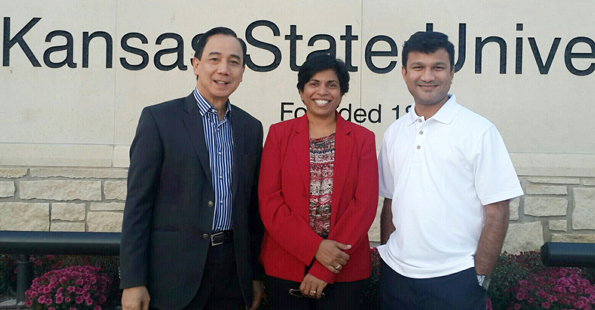 ICRISAT reaffirmed its commitment to work with partners and build new relationships during the visit of a high-level team to Kansas State University (KSU), Manhattan, USA. The ICRISAT team led by Dr William Dar, Director General, ICRISAT, and comprising Dr Shoba Sivasankar, Director, CGIAR Research Program on Dryland Cereals, and Dr Dileepkumar Guntuku, Global Leader, Knowledge Sharing and Innovation, ICRISAT, met with Dr April Mason, Provost and Senior Vice President of the University, and Dr John Floros, Dean and Director of the College of Agriculture and Kansas State Research and Extension. KSU is home to the Feed the Future Sorghum and Millets Innovation Lab (SMIL), which focuses on research and development for sorghum and pearl millet. In addition to the existing Feed the Future SMIL, KSU leads three additional Feed the Future labs, namely: (1) Postharvest Loss Reduction, (2) Wheat Genomics, and (3) Sustainable Intensification. The discussions centered on potential collaborative opportunities with the new labs on Postharvest Loss Reduction and the Sustainable Intensification Lab. The visiting team had discussions with the Department of Grain Science and Industry at KSU, specifically with the International Grains Program (IGP). Dr Dar and team presented a seminar on “Why invest in and partner with ICRISAT?” to a packed group at the College of Agriculture. Dr Dar emphasized ICRISAT’s continuing engagement with the SMIL team, and said that it is time now to elevate the R4D engagements between the two institutions, given the different Feed the Future labs at KSU, and the mutual interest in food processing represented by the Agribusiness and Innovation Platform and the Smart Foods Campaign at ICRISAT, and the International Grains Program at KSU. Dr Dar and team also visited the controlled environment facilities, rainout shelters and field-based heat-screening facilities for sorghum and millets and the breeding and genetics nurseries for sorghum. Dr Dar and Dr Guntuku also introduced ICRISAT’s initiative, “One Agriculture One Science”, to Dr Mason and Dr Floros. ICRISAT team visited KSU on 20 October and were hosted by Dr Nina Lilja, Associate Dean, International Agricultural Programs and Dr Tim Dalton, Director, SMIL. 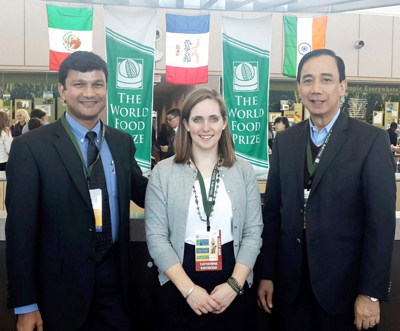 Earlier on 16 October at the World Food Prize Symposium, ICRISAT’s initiative ‘One Agriculture-One Science’ gained momentum with support of international experts who participated in the event. Representatives expressed support for the concept of having universities pool resources to develop technological tools that will allow educators from across the world to make modern agricultural research accessible to smallholder farmers, students, faculty members and other stakeholders throughout the world. One Agriculture-One Science is a global education consortium to use technology to advance international agricultural education and extension, and initiated by ICRISAT and partner universities like University of Florida (UF), Michigan State University and Iowa State University. “It is clear that to meet the productivity goals required in the future, more specific attention must be directed not only on gains and application of technology and the creation of innovations, but also to the development of the human capacity and institutions that will transmit these to the end users,” said Dr Ian L Maw, Vice President, Food, Agriculture and Natural Resources, Association of Public and Land-Grant Universities. During interactions with students of Global Youth Initiative Dr William Dar and Dr Dileepkumar Guntuku challenged high school students to come up with solutions to improve productivity and feed 9.1 billion people by 2050. They also challenged the students to devise innovative ideas to make the impressive gains in productivity found in some parts of the world the norm across developing countries of the globe. Students responded by suggesting that, improving and enhancing agriculture education is the way to achieve global food security, accessibility and affordability. Dr Dar and Dr Guntuku were part of the expert faculty the included World Food Prize Laureates and other international experts to review the work of the students and inspire them with their own work and contributions. Around 165 students interacted with the ICRISAT team and other experts. Women for long were considered to be a burden in parts around here. We wish to shatter that belief. We have witnessed how agriculture transformed the lives of several women in nearby villages. It is now our time to experience success, said young college graduates, Ms Seema Choudhary and Ms Sunita Choudhary of Mundia village, Rajasthan India. Seema and Sunita are among a group of 50 young women who, convinced by the returns gained by farmers in other villages of Rajasthan, expressed their willingness to take up pigeonpea cultivation and seed production on their farms. “We have both hope and confidence. Many youth after finishing college move to bigger cities in search of jobs. We, however, want to make the best of our means and help our parents maximize profits in agriculture,” they add. Also recognizing the important role played by women in agriculture, a new initiative is being undertaken by ICRISAT and partners to encourage the involvement of young women farmers from Rajasthan in pigeonpea cultivation, seed production and post-harvest processing. Pigeonpea cultivation provided additional income and varied benefits like forage for livestock, and for cooking purposes. This remains a major draw for Ms Guddi Kumari, a young woman farmer from Mundia village. “Young women around here are keen on pigeonpea cultivation for the additional income it provides. This is helping them save up for their weddings. It is also seen as self-empowerment,” she says. At the Field Day recently organized by ICRISAT, women farmers in the village received guidance on pigeonpea cultivation along with an estimate on the costs incurred. They were also briefed on other value adding activities such as dal making, processing and packing, and marketing which could lead to extra income. Expansion of pigeonpea area, with a promise of improved and sustainable pigeonpea production, food and nutritional security in the villages of Jaipur district has motivated increasing numbers of farmers to take up pigeonpea cultivation in the state of Rajasthan. Ramon Magsaysay Award winner Dr Rajendra Singh, popularly known as the Waterman of India, was the Chief Guest at the event. 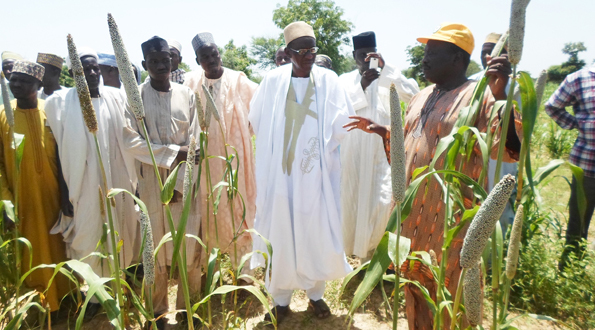 He urged farmers to grow more pulses like pigeonpea, which require less water. Expressing the need to conserve more water for future generations, he requested ICRISAT to extend their work to other districts of Rajasthan. 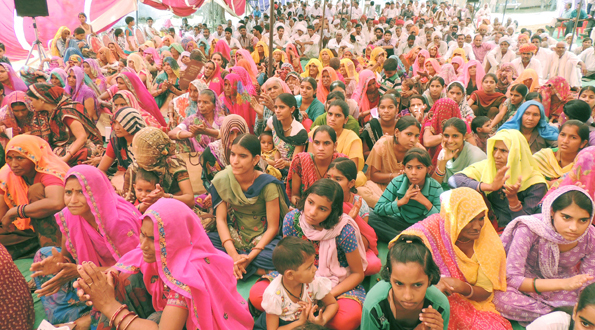 The event, which was supported by the Agriculture Research Station (ARS), Durgapura of the Swami Keshwanand Rajasthan University, Bikaner, Rajasthan, witnessed a gathering of 500 farmers, 200 of them being women. The technical experts who interacted with the farmers and responded to their queries included Drs CV Sameer Kumar, Project Coordinator and Senior Scientist, ICRISAT; Anupama Hingane, Principal Investigator and Special Project Scientist, ICRISAT, Myer Mula, Scientist, ICRISAT; SJ Singh, State Coordinator and Scientist-in-Charge; Mr Vijay Kumar, Manager; and Mr Uttam Chand, Scientific Officer, Rajasthan Agricultural Research Institute, Durgapura. ICRISAT organized a farmer’s field day recently in Gambawa village, Nigeria, a nomadic community area in Gumel to showcase better management practices to ensure soil health, improved post-harvest technologies and high-yielding varieties of millet, sorghum, groundnut and cowpea which are showing good results in the region. For decades, the Jigawa State in Nigeria has been plagued with high levels of poverty, degraded farmlands, heavy Striga infestation and other factors challenging agricultural productivity. ICRISAT along with its partners has been carrying out extensive research for prescribing new and improved technologies as viable solutions to these problems. On display at the event was the newly released improved millet variety LCICMV-4 called “Jirani” as well as details of various on-going on-farm research trials targeted towards addressing some of the biotic and abiotic challenges encountered by the farmers. “The interventions of ICRISAT and partners have helped us see agriculture beyond subsistence farming. Farmers are profiting from the collaborative work and on their own are trying new varieties and planting systems,” emphasized Mr Hardo Habu, community head. Ms Zainab MaiFura, a processor in the region echoes the same views. “The quantity and quality of my produce improved over the years which in turn has increased sales, income and profit,” she said, thanking the farmers for the supply of quality grains. The Government of Andhra Pradesh, India, has launched an initiative to provide agricultural debt redemption to farmers and also to act as a ‘one-stop shop’ for farmer development, welfare and empowerment activities. To empower its farmers, the Andhra Pradesh government formally launched the Rythu Saadhikara Samstha (Farmers Empowerment Corporation–FEC) on 21 October. Nearly 12,000 farmers participated in this mega event. 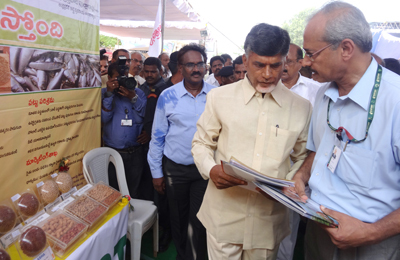 ICRISAT had set up a stall along with various government departments exhibiting seed displays and other improved technologies available to farmers for adoption along with posters and flyers. The FEC has been started with a paid-up capital of `10 million (US$ 163,305). In addition the government also released `50 billion (US$ 816,526,500) towards agricultural debt redemption. All eligible farmers who had availed crop loans up to `150,000 (US$ 2,448) would be covered under the debt redemption scheme. The FEC has a central role in the implementation of the Primary Sector Mission, formally launched in Anantapur district by former President APJ Abdul Kalam on 6 October in the presence of ICRISAT Director General Dr William Dar. The aim of the mission is to ensure that agricultural development in the state receives a boost. The ICRISAT Development Center played a major role in preparing the Strategy Paper for Primary Sector Mission. Dr KV Raju, Assistant Director, ICRISAT Development Center and Dr Ch Srinivas Rao, Scientific Officer, ICRISAT, represented ICRISAT at the event. Demonstration of carbonization of rice shaft. Women farmers in Kano, Nigeria, are being trained on benefiting from technologies for enhancing the sorghum value chain. The training of trainers workshop primarily focused on the use of sorghum in making bakery products like cakes, biscuits and bread; and producing bio-charcoal. The benefits of sorghum, food safety practices, hygiene, sanitation, and entrepreneurship were explained to the participants at the event. The training aimed to build the capacity of rural women to actualize the objective of Nigeria Sorghum Transformation Value Chain (STVC) in reducing poverty, improving food security, nutrition and health of women and children. The 2-day training, organized by ICRISAT, was attended by 21 women extension agents and group leaders drawn from the Kano State Agricultural Development Project. The participants expressed enthusiasm to form the ‘Women Sorghum Processors and Marketers Association’ and provide training to other women in their communities on new technologies. They have sought the support of STVC, ICRISAT and its partners. ICRISAT and STVC used the opportunity to link up with Africent Integrated Trade Microfinance Cooperative Society who provided training on carbonizing of agricultural waste product to make bio-charcoal. Large-scale adoption of this technology will help reduce the level of deforestation in semi-arid regions since women could use bio-charcoal as an alternative source of energy for household use as well generate income. Africent also promised markets and credit linkages to women entrepreneurs who are interested in making bio-charcoal. 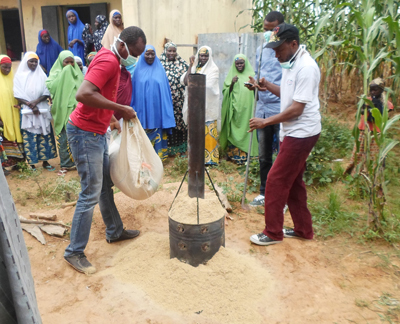 The material for making bio-charcoal includes easily available material like crop residues, weeds, rice shaft and irrigation channel weeds which are abundant in the rural areas of Northern Nigeria. The training was held recently at Kura Local Government Area, Kano state. The activity was organized under the CGIAR Research Program on Dryland Cereals and on Dryland Systems. 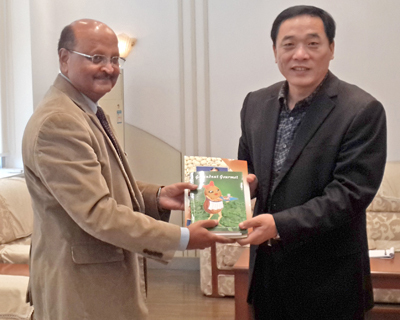 To enhance research for development partnerships with partners in China, ICRISAT Deputy Director General-Research, Dr CLL Gowda visited the Shandong Peanut Research Institute (SPRI), Qingdao (Shandong Province) and Oil Crops Research Institute (OCRI), Wuhan (Hubei Province). ICRISAT has a partnership with SPRI over the last three decades and has been providing germplasm and conducting capacity building of its scientists. A MoU between Shandong Academy of Agriculture Sciences (SAAS) and ICRISAT was signed in December 2013 and as part of the MoU, it is proposed to establish a joint SPRI-ICRISAT Laboratory for Biotechnology. Shandong province in China currently has the highest average yield in groundnut (nearly 4.5 t per ha), due to improved high-yielding varieties and good agronomic management (polythene mulching, application of fertilizer and growth promoters, irrigation and pest and disease management). They plan to increase the average yield to >5.5 t/ha in the next ten years. The research collaboration with OCRI, Wuhan has been responsible for strengthening research and development, especially in developing improved drought tolerant high-yielding varieties with resistance to bacterial wilt and management of aflatoxin contamination. Many released varieties were derived using ICRISAT-supplied germplasm. Under the Cereals and Legumes Asia Network (CLAN), ICRISAT supported the “Asia Working Group on Groundnut Bacterial Wilt” that is coordinated by Dr. Liao Boshou, Deputy Director General, OCRI. This working group is now expanded to include other ‘soil-borne diseases’ of groundnut, and supported by restricted grants provided to ICRISAT by the Government of China through the Chinese Academy of Agriculture Science (CAAS). In June 2013, ICRISAT Director General Dr William D Dar and Vice-President of CAAS inaugurated a ‘CAAS-ICRISAT Joint Laboratory for Aflatoxin Research’ at OCRI, Wuhan. The joint OCRI-ICRISAT proposal on “Developing groundnut varieties with shell resistance to Aspergillus infection” was recently approved. This project will be conducted under the umbrella of the Joint Lab. Discussions were held regarding the fellowship program (supported by CAAS grants to ICRISAT) wherein CAAS scientists will come to ICRISAT for capacity development and joint research. Currently Dr Gowda is the International Advisor to both the Institutes. Creating post-harvest value, developing innovative foods to tap the micronutrient-rich nature of the dryland cereal crops – barley, finger millet, pearl millet and sorghum, strengthening seed systems and input markets, and stronger policy interventions are some of the critical accelerators that will help in improving adoption of dryland cereals. The key outcomes of the Bi-Annual Planning Meeting of the CGIAR Research Program on Dryland Cereals included the inputs of crop improvement technologies to deliver farmer- and market-preferred traits together with integrated crop management practices as being critical for improved benefits to farmers. Crosscutting themes like gender research, data management and communications were also highlighted in the discussions. Addressing the delegates, Dr CLL Gowda, Deputy Director General-Research, ICRISAT and Dr Shoba Sivasankar, Director, CGIAR Research Program on Dyland Cereals emphasized on new partnerships and expertise to fill the gaps identified in the new strategic roadmap. “An important thing that reflected in the discussions is the beginning of cross flow of information between flagships, which is critical for the success of the program,” Dr S Sivasankar said. The meeting, held at ICRISAT headquarters on 7-9 October, was aimed at strategically prioritizing implementation plans of the program for 2015, and to identify high priority R4D outcomes that would feed into planning of the second phase of the program beginning 2017. All the presentations and discussion documents can be accessed from the following link: http://drylandcereals.cgiar.org/planning-meeting/ or scan the QR code to visit the document repository directly.